Harry and the dinosaurs are busy helping Nan pack Harry’s bag for his first-ever sleepover at his friend Jack’s. As well as the essentials, Harry packs a book, some toys and some moss for the dinosaurs. His big sister Sam has to upset him as usual, telling Harry that it was stupid to put the moss in. Harry, however, stands up for himself, saying that the moss is for the dinosaurs to make sleeping bags from in case they are homesick. Although Harry’s Mum and Nan were worried about leaving him, they need not have been. Jack and his parents are very welcoming, and the dinosaurs are excited about playing hide-and-seek. Jack’s dad takes the boys up to the attic and shows them the bats sleeping there; Harry wonders if they might fly into the bedroom and get stuck in someone’s hair. The boys and the dinosaurs have lots of fun playing in the garden; they especially enjoy Jack’s tent. Bath time is an opportunity for more fun and pretend fights. When they are tucked up in bed, the boys have no less than three stories followed by a few extra minutes for play. The dinosaurs unfortunately make so much noise that Jack’s Mum has to ask everyone to settle down. Harry, however, can’t sleep and is worried by tapping noises on the window. He’s afraid it might be a bat. Jack’s dad comes in and tells him it’s only branches of trees, and he decides to bring the tent into the bedroom to cheer everyone up. That idea turns out to be a great success and convinces Harry that sleepovers are wonderful. 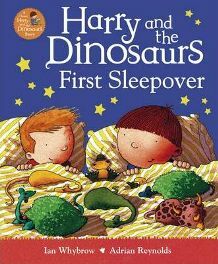 “Harry and the Dinosaurs First Sleepover” continues author Ian Whybrow’s tradition of centring the stories around situations that young children have to face for the first time. It shows how sleepovers are likely to be a mixture of fun, excitement, worry and homesickness. Here it is the fun and excitement that prevail, and the story will help to encourage children to feel that spending the night at a friend’s house is an experience they will want to repeat. The fact that it features dinosaurs, bats, toys, a trampoline and a tent makes it a book that provides plenty of interest as well as opportunities for discussion. The text is set in a large, clear font, and there are never more than half a dozen lines per page. It is superimposed on the illustrations, usually on a light-coloured background, although there are a couple of exceptions to this. The vocabulary is quite varied; there are of course names of species of dinosaur, and also the fact that bats are ‘a protected species, and nocturnal’, the meaning of which is then explained. As well as this there are one or two fun onomatopoeic phrases such as “Num num!” when Apatosaurus tastes leaf-flavour toothpaste, “Raaah!” from the dinosaurs and “Blaaaaast!” from the robots. It is essentially a book to read aloud, but it might also appeal to a young independent reader with a special interest in dinosaurs. Adrian Reynolds’ illustrations for “Harry and the Dinosaurs First Sleepover” are colourful and bold, bringing the story to life and emphasising the fun. The scene in the attic has a rosy glow from the torch so that it isn’t too scary. When Harry and Jack play on the trampoline, they are joined by dinosaurs and robots flying around with a backdrop of mountains behind a dry stone wall. Bath time is a riot of bubbles and dinosaurs squirting recklessly. There is plenty to amuse young children throughout the book. “Harry and the Dinosaurs” may seem to be more of a boys’ book but in fact is likely to appeal to most young children. Sleepovers seem to be popular even at the age of three or four these days, and children in a group can talk about their experiences either before or after hearing the story. It is also a useful book for learning a little about dinosaurs or bats whilst retaining the element of fun. Definitely recommended for encouraging a young child who is about to go for a first sleepover, the book is still likely to be popular with those who are used to the experience. No Comments on "Harry and the Dinosaurs First Sleepover"